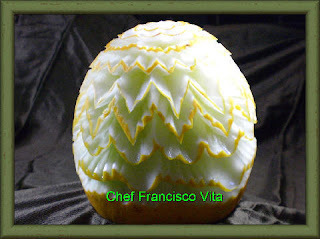 Continuing on my work to promote and salute the work of art of great Vegetable and Fruit Carving Artists on my blog, today I have the privilege of showcasing the work of another great Artist, Vegetable and Fruit Carving Instructor Par Excellence, and Certified executive chef and member of ACF California Capital Chefs Association to name the least! 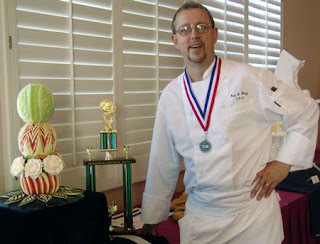 Chef Ray L Duey, a certified executive chef and member of ACF California Capital Chefs Association, has spent the last two decades developing his skill and creating fruit-and-vegetable carvings for weddings, events, classes and seminars. In 2004, he opened Chef Ray Presents, where he teaches the specialized art form to a wide variety of professionals across the United States. Duey has received numerous awards in national and international competitions. In addition, he is also corporate executive chef at Buffet Euro, San Francisco, Calif. 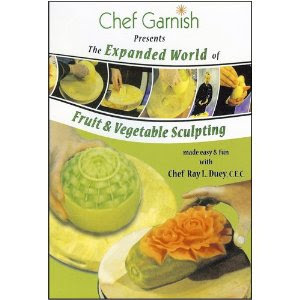 Check out some of his wonderful products such as his Fruit and Vegetable Sculpting DVD Video, and other unique tools at his site. 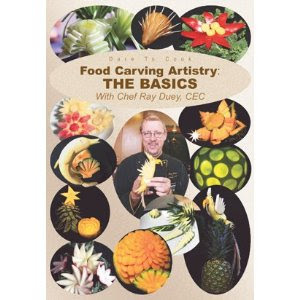 Chef Ray L Duey has some great DVD's and Books which are worth reading and watching for a first hand experience of his carving provess! 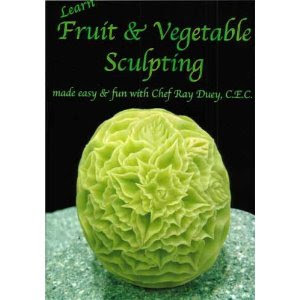 Fruit and Vegetable Sculpting DVD Video. Here he shows how to do 23 different fruit and vegetable carving pieces to WOW your clients! Also use it as a teaching aid for your students or staff. 94 minutes of Thai techniques with animal, rose, and candle ideas interwoven. You will really get inspired and excited when you view these !! 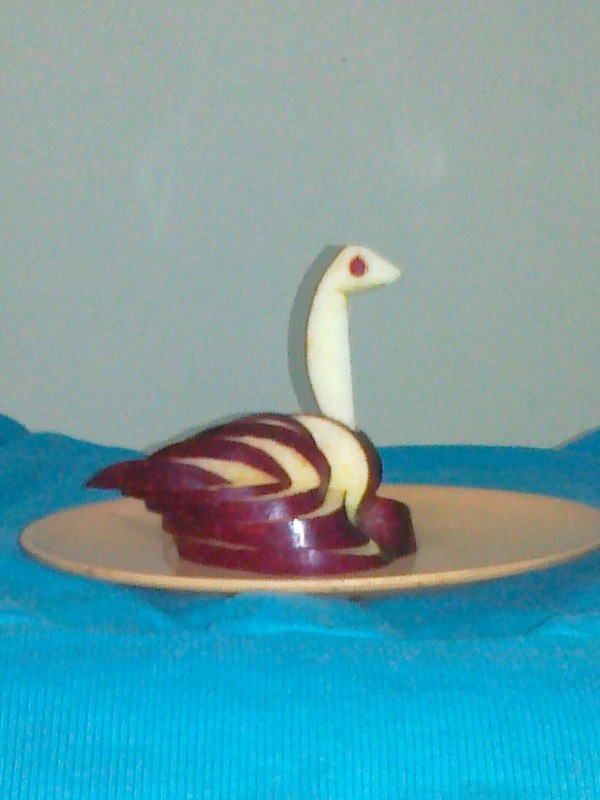 A DVD with new and unusual fruit and vegetable carving techniques. Covers 11 new pieces as well as an in-depth view of the tools and their uses. 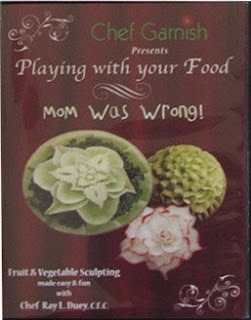 This is a follow-up to the first Fruit and Vegetable Sculpting DVD. A must have for your continuation in this field!! This was only a brief introduction about Chef Ray L Duey and his work. I am sure you will love to visit his site as above and check out more details while watching his videos for a practical review of his fantastic art. Do keep a watch out for some more Artist reviews and introductions. 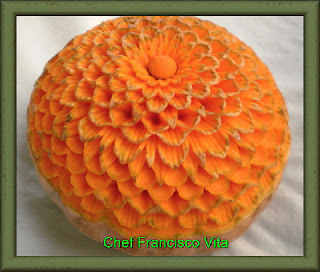 Continuing on my constant endeavour to publish and promote the wonderful work of Art of Vegetable and Fruit Catvings by various artists, I am privileged to publish the work created by my dear Friend Chef FranciscoVita. 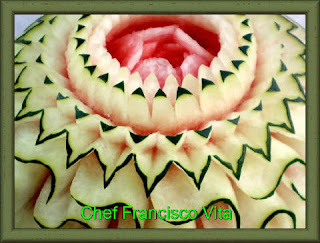 There is so much wonderful work that Chef FranciscoVita has done which you can also see on his site but I thought of posting some the best work he has done on this blog here. 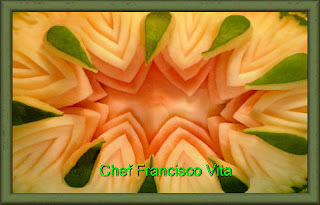 I will give you the links of the places where you can see more of his work, but for now enjoy the exquisite work created by Chef Francisco Vita. 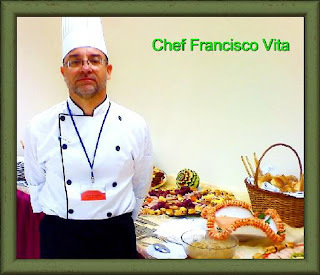 At first let us have a brief overview of the Chef Francisco Vita's Profile! 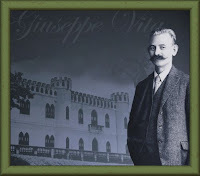 Chef Francisco Vita: Great grand son of Italian immigrant Giuseppe Vita, one of the founders of the industry "Guarana Fratelli Vita" in Pernambuco and Bahia, Brazil. He has Abdicated 15 years ago of a successful career as Director in a international corporate to engage and developing exclusively his talent, becoming a Chef de Cuisine. Here he offers only his facet of sculptor. He had the first contact with this food carving art in 2004 on his season working on ships cruises where he has closely observed the performance of some of the great masters of Asia. engage the Chef and he will come to you. We develop our work throughout Brazil and abroad. While I take you through some of his work of art on various Vegetables, Fruits and even sculptures. I am now eagerly waiting to publish some of his best work of carvings and leave it to you to visit his site and see more of his fantastic work. I am sure that you will be stunned by his work and stay glued to the site for long. Here are some of his best works which I personally liked. At present I will publish only some of the images in each category and rest you can see on the site itself where there are hundreds of images of his exquisite work. Sculpture in Clay and Other Carvings. I am sure you will have loved these images and are wanting to see more. Yes you can! 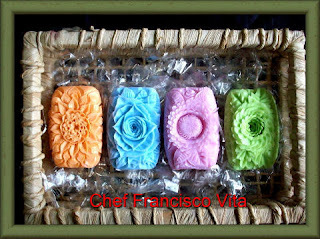 I have given all the information about Chef Francisco Vitas' Profile and contact information here so you can browse through his site, or contact him personally. Let us also see what he has to offer and how you can contact him. We bring to you a little of this Milenar Thai-Art of Fruits and Vegetables Carving. Graduations parties, Corporate parties and everything else according your creativity. 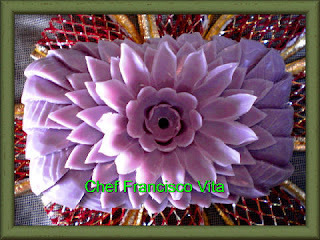 I am sure that you will love this work of art created by Chef Francisco Vita. Keep a watch for more information about other such great Artists! Have a great time! I thank all my Friends, readers, and patrons for their continued support, motivation, guidance, which has prompted me to create this page not only for all readers but specially for those fans and readers on Facebook who were a special source of inspiration for me to take up this wonderful Art of Vegetable and Fruit carving as a topic for my Blog as well as learn it myself and my daughter Mansi who also has taken a liking for this wonderful art. 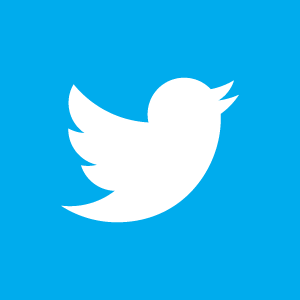 Keep a watch for some great new posts coming up! I would once again like to thank all the wonderful Vegetable and Fruit carving Artists from whom we get inspired to do Carvings ourself. In my post some time earlier, I have to thank Nitda Phongcharern especially for the wonderful tool set she had presented me for the the Post I had published regarding her work on this blog. This tool set was the key to the motivation my daughter Mansi Kate (13 years old) got from constantly reading about and watching the videos of all you wonderful artists. If you wish you can read about this post at -Thank You Nitda Phongcharern and All Vegetable and Fruit Carving Artists She slowly started practising along with me and slowly picked up the art. Though she is a novice in this art, her dedication and liking for the carving art lead her to try out various other simple carvings like Carrot, Tomato, and cucumber which I have already published earlier. 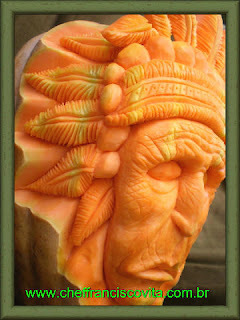 For those who have not seen them you can still see the carvings at this post -Vegetable Carving display by Mansi Kate. Further motivated by the work of art displayed by so many of the artists, she tried her hand at Fruit carving recently, after carefully and dilligently watching carving videos of various artists. 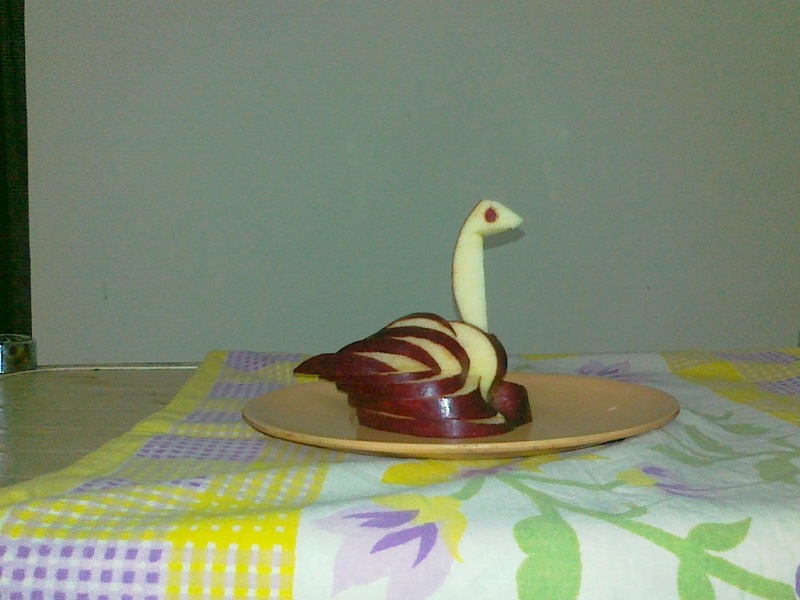 Finally she got her hand on an Apple from which she created a Swan. 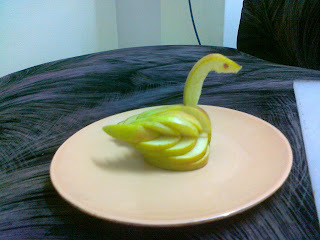 I have posted the Apple Swan created by her which she did in one stroke, without any practise. Though it took her some time I am proud that she could create such a nice carving especially being her first Fruit Carving. Here is one of them. As you will see her enthusiasm prompted her to experiment with two different colors of Apples, the Green Apple, and a Dark Red Apple which stands out in contrast. I am aware that this is a very simple carving as compared to the work of carving by expert carvers worldwide, but I have posted it here to motivate her further, as well as thank all those artists whose inspiration has led her to do this art. I am sure she will learn from you all and create better carvings which we are already in the process of planning to display very soon. so keep a watch for our next set of Vegetable and Fruit carvings which is going to be surprise and a joint effort by me and Mansi together. Hope you all like it! Here is a fantastic Vegetable and Fruit carving artist and Instructor -Warunee Tintamusik - who has more than 15 years of experience and having won multiple awards at the Texas Culinary Salon Show at Dallas Convention Centers in 1990, the secrets of her more advanced techniques, designs, and unique styles will finally be revealed in this collection of videos, and information about her and her work. I have been following her work and videos for a long time and finally thought of writing about her and also promoting her work and videos on my Blog as is my privilege to do so for the so many fantastic artists like her who work wonders with their hands and create magic with Vegetables and Fruits. This is a small efort to salute her work! 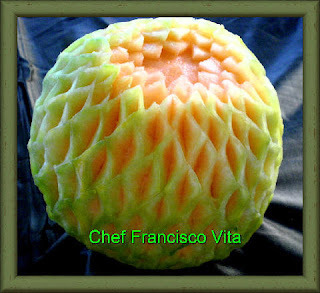 "Welcome to Chuncarve is the phrase used when referring to the Thai Culinary Art of Fruit and Vegetable Carving. Chuncarve slogan is “Fruit Stylist”. 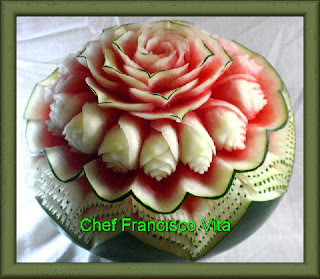 It because I create a beautiful design, style and reconstruct the art of food which I'm specialize in fruits and vegetables carving following the traditional Thai method of skill that has been originated practiced in the Royal Thai courts for centuries. " our purpose is to sell fruit carving DVD, fruit carving and garnishing tools for affordable price. Her site is a treat to watch with the exquisite carvings she has displayed along with DVD Lessons and Tools sets available on the site. Facebook search: Chuncarve "Fruit Stylist"
I will not waste any more time in writing about her as her work will speak for herself which you can see in this short introduction video which I have published here to give you a teaser or so about her work. You can see more of her videos at her Channel - http://www.youtube.com/user/wtimm9. I can assure you that you will not stop watching her fantastic videos, which I am going to publish on my other blog soon. Here is a few wonderful videos to start with which I liked very much! Chuncarve Holiday Garnish.....where she has created these colorful carvings for this year holiday garnish ideas for anyone that looking for table garnish to greet your family and friends, enjoy her collection that she put together for you this year. Truly an exquisite collection. I now leave it to all my wonderful readers and patrons to enjoy the wonderful work of art of Chuncarve "Fruit Stylist" Warunee Tintamusik. Hi Friends, back after a long time. Appologise for the long wait, but will be up with some great posts and offers for you all! "Fruit and Vegetable Carving: Food Craft at Your Fingertips" is a treasure trove of unusual ideas for vegetable garnishes, with step-by-step instructions on how to make them. Within the shape of a cucumber the author visualizes a boat, a bird or a lily and shows you how to reveal that shape. All you need is a small, sharp knife - no fancy equipment is required.Let's Have a Party offers recipes presented with a flair - a Peacock, crafted from carrots and spring onions, flaunts the Pinwheel Sandwiches in his tail - a feast for the eyes as well as the taste buds.In Vegetable Sculpture onions are reborn as Chrysanthemums; Swans fly out of radishes and Goldfish emerge from carrots. There are Coconut Palms and Carts - but most of all, there is inspiration to let your own imagination take over.Table Celebrations transform your table with lively tableaux - an apple-red Santa sits on a Reindeer-drawn pumpkin Sleigh for Christmas, waving to a jolly turnip Snowman...Snow White in a cabbage leaf skirt, with her loyal Seven Dwarfs, gather in front of their charming cucumber Cottage...Chinatown introduces the elegant Corn Doll who is Entertained by three Musicians with a banjo, trumpet and drum, near a Pagoda that is Intricately sculpted from a single carrot. Create a stamp of distinction, an aura of excitement, a mood of mellowness...Strike magic on your table and turn your next party into an unforgettable event. Garnishing: A Feast for your Eyes! A professional chef shares his secrets for creating exciting, attractive garnishes and food sculptures. Covers all aspects of formal food presentation, including how to draw, sculpt and build with fruit and vegetables, lay out a buffet table, arrange food on platters, chocolate artistry and more. Full-color photographs. Introduction,History,How to get started ,How long to get the expertise ,Instructions ,Thai Carving ,Patterns ,Watermelon Carving ,Watermelon Baby Buggy ,Watermelon Basketball ,Watermelon Swan ,Watermelon Whale ,Watermelon Ship ,Apple Leaf ,Carving a Green Mango ,Pineapple Butterflies ,Watermelon Smileys ,Romantic Watermelon ,Fruit Bouquet ,Watermelon Flower Garden ,Water Lilies ,Apple Carving ,Apple Design ,Chunks of Pineapple ,Carving Baby Pineapples ,Carving Papaya Leaves ,Carving Papaya Flowers and Leaf ,Carving Little Butterflies ,Carving Water Lilies from Papaya ,Carving Cantaloupe Green Rose ,Carving Styling Lotus from Cantaloupe ,Carving Cantaloupe Flower ,Carving Cantaloupe Dahlia ,Carving Cantaloupe Sunshine Flower ,Carving Cantaloupe Sunflower ,Carving Cotton Rose on Guavas ,Carving Guava Blossoms ,Carving Guava Bowl ,Carving Rose Apple Blossom ,Carving Tulips from Rose Apples ,Carving Mango Flower ,Carving Mango Dahlias ,Carving White Marigolds from Green Mango ,Carving Leafy Mangoes ,Fruit Carving Knife ,Decorating Knife ,Garnishing Tools ,Carving Knife ,Flexible Carving Knife and much more...! Japanese cuisine is renowned for the beauty of its presentation. Among the key elements in this presentation style are mukimono--the decorative garnishes and carvings that add the final flourish to a dish. It might be a carrot round in the shape of a plum blossom. Or a scattering of cherry blossoms plucked from a radish. Perhaps a swallow, a butterfly, a ginkgo leaf or a cluster of pine needles. Whatever the motif, it will have been created to delight the eye and the palate with its shape, color, and taste. In The Decorative Art of Japanese Food Carving, internationally acclaimed chef Hiroshi Nagashima offers 60 edible garnishes and food carvings for home, party or professional use. Some are designed to be set on top of the food. Others are fashioned to hold the food--and sometimes, they simply are the food. 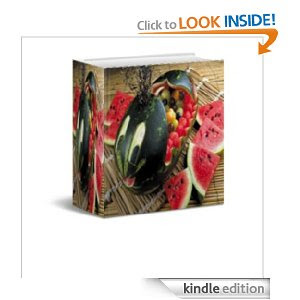 Each is introduced in full color, with easy-to-follow, step-by-step instructions, sample food arrangements, further ideas and secret, insider tips for successful presentation. Most are simple enough for the amateur chef to master, although a few are quite challenging and require much practice. Nagashima's instructions rely on household utensils found in a typical American kitchen--from knives to peelers to cookie cutters--and use familiar, easily attainable ingredients. 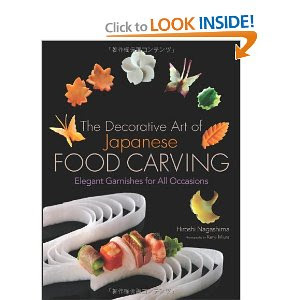 The Decorative Art of Japanese Food Carving is more than a practical handbook, however. It is also an inspiration book, filled with creative suggestions and inventive ideas to enhance and transform the way we cook. More Books and guides to come for you soon! Keep a Watch for the best to come! You can also click the "Follow vegfruitcarving"-button on the right hand side to keep in touch with my latests posts. Follow me directly on Twitter or mail me your twitter Id's to my special mail for this blog at - vegfruitcarvings@gmail.com and I will add you also to my mailing list for special posts and information. I once again thank all my viewers, readers, friends, and well wishers for the support, motivation and continued patronage. Will continue to bring you the best of Vegetable Fruit carvings as always! 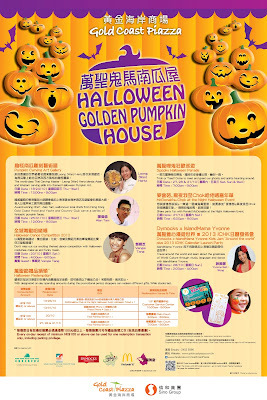 Gold Pumpkin House at - The Gold Coast Piazza. You can click on the Poster and see more details. Check out the Highlights & E-coupons for special offers! Click here for the special offers as well. 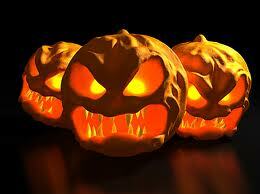 What: Spooky Halloween party with a fab parade and face-painting for the kiddos. Where: Gold Coast Piazza, Castle Peak Bay, New Territories, Hong Kong, (Take bus K51 from MTR Tuen Mun Station Exit C2), +852 2452 6566, www.goldcoastpiazza.com.hk. Continuing on my effort to bring you some wonderful Garnishing videos here are a few videos which show very nicely how to Garnish your Plates with so many wonderful designs. 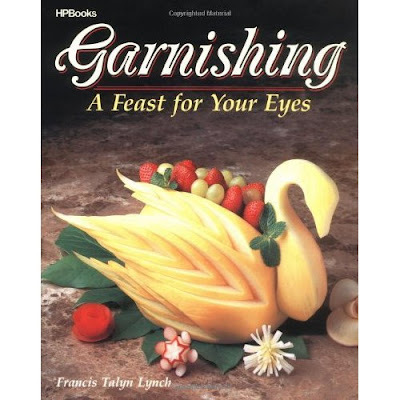 The publisher also shows how to create wonderful carvings and garnishing with Pineapples. So have a great time! Learn the basic of butterfly plate garnishing. Learn the basic of Daisy plate design. 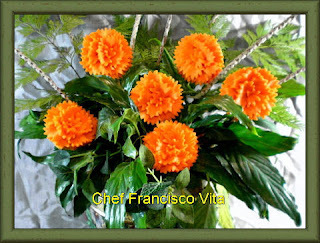 Learn basic carving of orange basket of the Garde Manger Art. Learn the basic carving of Pepper Bowl. 3-ways of how the Garde Manger serve the pineapple. I am sure you will enjoy this series, and while I look out for more such wonderful videos take your time to learn Garnishing from the above videos! With Guests coming in at all times for various occasions, it would be wonderful to have some garnishings for your soft drinks and cocktails which will not only make the drinks more presentable, but also maybe allow your guests to bite on a few fruits! Here are a few videos I liked and thought of sharing with you. So watch the videos, use the ideas the publisher gives and create new wonders yourself! Have a great time! This video exhibits various Fancy Cocktail Garnishing ideas. Will be checking out for some more Garnishing ideas, so keep a watch! Edible Bouquets and Table Decorations for all Occasions. Continuing on my search for better Fruit and Vegetable Carving sites and displays I have found some wonderful sites and videos for making Edible Bouquets and Table Decorations for all occasions. With festive times always around the corner or even your wonderful guests just dropping down on you with a surprise, it is always good to have a trick up your sleeve, and stun your guests with your culinary art. So here are some sites which have some wonderful stuff, which you could first practise and add to your skills. Take your time and check out the sites, and maybe you could be having a wonderful evening at the table! Here is a wonderful site I found that has loads of wonderful bouquets all ready to be served out to you. Besides Bouquets they also offer Party packs, and Gifts for occasions so check it out now! They also have another site which is a new one which is specially catering to WEdding Table Decorations which you can check out at their banner below. I have given you the direct link to the site so you can enjoy their work and even order some of their wonderful work from the site itself by calling them on the number they have given. So have a great time. Here is a wonderful video from the same site above which shows the many arrangements and items that they offer. Wedding Table Decorations. Edible Bouquets Edible Arrangements. Fruit arrangements and decorations for Weddings. 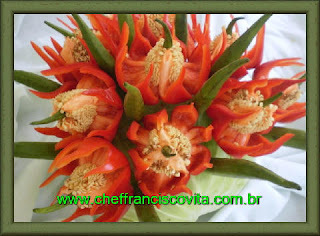 An edible bouquet or arrangement of fresh fruit, made to order and arranged and presented like a bouquet of flowers as a table decoration or centrepiece. Chocolate covered strawberries and marsh mellow kebabs arranged on a platter as a table decoration. Looking out for some more wonderful sites and videos till you enjoy the above one. have a great time! Hi Friends, it's been some time since I posted on this site, so sorry for the delay. Here I have come back with some great sites I browsed which gave so much information about Vegetable Fruit Carving Art. I have given you the direct links so that it will be easier for you to go to the site and check them out. They are just wonderful and I was amazed at what you could do with Vegetable and Fruits. I ams sure you too will like these sites. So without much ado get going anc check out these sites. Have a great time, while I browse for more information specific to Vegetable and Fruit Carving which I have already collected, but have to collate and post on this blog. Happy reading! Edible Glamour. 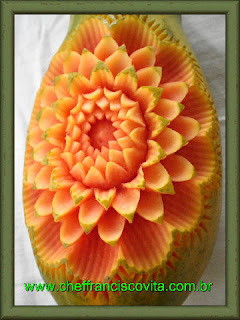 A Wonderful site with loads of Fruit Carving information. Khan Fruit Carving. Fantastic site with Carvings, Tools, Events, Courses. AchefsHELP....Another great site with loads of Information. KAE-SA-LUK ...The Site of Pam Maneeratana - Master Carver. 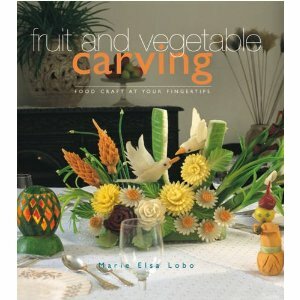 And Here is A Guide to Vegetable Carving and Salad Arrangement a great book. These are only some of the wonderful sites I was browsing through and thought of informing you as well so you could all benefit from their information and work. This Art is truly so great that one finds it captivating and mesmerisizing. I am sure you will make the best of the above sites, until I get back with more information. Have a Great time!